Today's post will be short, it's about a new remix I composed for the grand maverick remix battle in the OCRemix forums. It's a remix of Chill Penguin and Storm Owl's themes from Mega Man X and Mega Man X4. Enjoy! So last time I talked about my favorite software synths, and as you may have noticed I mentioned some of them were completely free, and pretty damn good too. So I thought I'd make a post about how you can start and set up a producer environment for cheap, and even for no money at all. Reaper's interface is based in Cakewalk's Sonar, which is my favorite DAW that supports VSTs (I will get into VSTs a bit later). Reaper comes with a set of intruments and effects but no sound libraries which is no problem since I will give you links to tons of free sound libraries anyways. Most importantly to this guide, Reaper costs only 60 US dollars. That is almost nothing if you compare it to other professional DAWs like Sonar and Reason which cost 500 dollars or more. 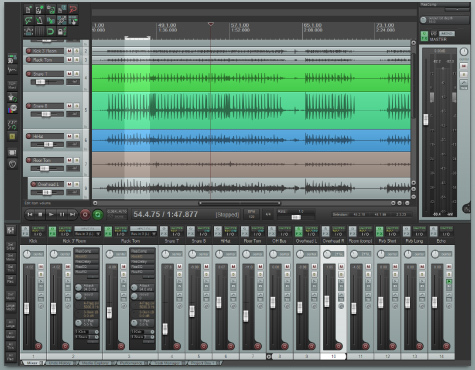 With Reaper you will get everything you need and it's even better than some of the popular DAWs out there. You can even download Reaper from the official site and try it for as long as you like! yeah that's right you can try the full version for a year if you want and not pay anything at all, but seriously I recommend just paying the modest price they are asking because these guys are incredibly cool and they are giving you an amazing piece of software for a discounted price and no strings attached at all. Not many people do that. Now that you got your host set up and ready you need some VSTs. Well, if you got Reason you can skip this section since Reason doesn't support VSTs, but then again, why are you reading a budget guide anyways?. First you need some instruments and I mentioned a few of my favorites in my last post: they are synth1, Tal-u-no 62, Tal-Noisemaker, GTG JP-1, among others. These I mentioned are pretty professional sounding and a good start, but there are tons of free VST instruments out there that you can get and you can find them on this website: kvraudio. KVRaudio hosts thousands of free instruments for you to try, and you can also check commercial instruments there as well. For reverb, you can get Ambience or Tal-Reeverb. Both are amazing, professional sounding reverb effects. You can use tal-reverb for most cases, but if you want more complex or detailed reverb you can use Ambience. For delay effects, Tal-Dub(1,2 or 3) and Karma Dee-lay are both pretty good. For distortion, there are several options. Tal-tube, Tal-bitcrusher, FreeAmp, Cyanide and The Glitch all offer different flavors of distortion that should be adequate for most genres. For compression and/or Limiting I suggest jsCompShaper, ThrillseekerLA, Blockfish or Classic Master Limiter. Again, all of them offer different flavors of compression. Compression is a complex topic and a bit daunting at first, so if you can start with the Classic Master Limiter as it offers a very simple form of compression that works in some cases, and work your way to more complex compressors like the jsCompShaper. If these aren't enough for you, you can always search the KVRAudio database for hundreds of other effects. But say, you want real instruments instead of synthesizers, no problem, you can find hundreds of soundfonts (collections of samples of real instruments) on the web, and also for free. You can try Hammersounds, Darkesword's soundfont database, and even findsounds.com. This thread at OCRemix.org has some links too. What's a good EDM song without a punchy beat? Beatproduction.net has tons of sample packs you can use for your song, and Dorumalaia also has tons of drums samples along with unique ethnic sample packs. But when it comes to drum samples, a good google search is also your best friend! free drum sample packs are all over the web. With all of this together you're ready to start your music production hobbie. I've been using these tools for years and they've served me well. They're proof you can make decent music for free nowadays. Have fun!